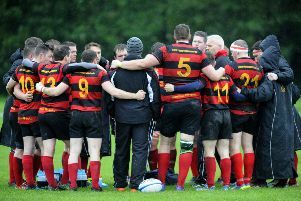 Grangemouth Stags edged a topsy-turvy contest in a dramatic finale. There was some fantastic defence in the closing minutes to prevent Hillfoots from sneaking the win, which they held at the interval. However Stags did enough to make the semi-final of the Caledonia Shield, to take place on December 15. The home side dominated at the start of the half and after some early pressure they were rewarded with an unconverted score in the corner. The Stags hit back and Skelton narrowed the lead with a penalty a few minutes later then Forsyth dived over in the corner and Skelton landed the difficult conversion. In the theme of the match, Hillfoots hit back and regained the lead after 15 minutes. For long periods Stags were playing rugby in their own half, but got a break with another Skelton penalty. A few minutes later it was Grangemouth who were turned over on halfway and a break by the Hillfoots centre resulted in another converted try under the posts. HT Hillfoots 19 Stags 13. At the start of the second half Hillfoots were starting to dominate at the breakdown and a long kick downfield resulted in a lineout inside the Stags 22. The lineout was a mess and after some close range drives Hillfoots drove over for another unconverted score. Grangemouth made a series of changes to the pack andbegan to win more ball and on 60 minutes Grangemouth added try number two. Gemmell made the initial break before feeding on to Forsyth. The ball was recycled for Skelton to skip round his man and score and he converted his own try. Five minutes later and Grangemouth were back in the lead with McLay scoring under the posts and Skelton maintaining his 100% record with the simple kick. The final 10 minutes was a frantic affair with Hillfoots attacking and some desperate defence from the visitors. Hillfoots had some kickable penalties which would have tied scores but they went for the try to win, but it didn’t come. This Saturday Grangemouth are back in league action as they travel to face Alloa with KO 2pm.